The 2016 Toyota Tacoma does not appear dramatically different, even though every scrap of bodywork has been restyled. That’s because its major dimensions (other than the length of its elongated snout) hover within tenths of an inch of the outgoing truck. Its wheelbase and track width dimensions have not changed, and the suspension pickup points haven’t budged, to the extent that a current Tacoma lift kit will transfer straight across. It’s a different story inside the cab. Every interior surface, instrument and knob has been redesigned and brought up to date. And all 2016 Tacomas finally get a genuine center-pull parking brake instead of the clumsy foot-pedals and T-handles of yore. Dig deeper and you’ll find a new cab structure that makes extensive use of high-strength steel and ultrahigh-strength steel to significantly improve roof crush strength and side impact protection without adding weight. An all-new 3.5-liter V6 engine makes 278 horsepower, a full 42 more than last year’s 4.0-liter V6. The new V6 is a clever engine that is both port- and direct-injected, a hyper-efficient one-two combo that enables a unique direct-injector self-cleaning cycle when the port injectors are running the show. What’s more, this engine features variable valve timing that can seamlessly swap between the workaday Otto cycle and the efficient Atkinson cycle for optimum performance. The base 2.7-liter four-cylinder carries over unchanged. It’s still rated to produce 159 hp and 180 pound-feet of torque. There are a total of three transmissions, although the five-speed manual is only offered on the base model four-cylinder. The six-speed manual and six-speed automatic each offer a newly optimized axle ratio. In the case of the six-speed automatic, it produces both a 7 percent improvement in low-gear crawl ratio and a 16 percent reduction of highway cruising rpm. Much the same is true of the new six-speed manual, which is reserved for certain V6 4×4 sport and off-road configurations. Underneath, the Tacoma’s frame has been beefed up with additional high-strength steel. Most 4×4 versions get a chunkier rear axle housing that accommodates a stouter 8.75-inch ring gear, and the 4×4 transfer case has been completely redesigned for added strength and quicker engagement. How Many Body Styles and Trim Levels Are There? Toyota has altered the 2016 Tacoma model lineup by banishing equipment packages like SR5, TRD Off-Road and Limited from the options list and making them trim levels instead. So the 2016 Tacoma comes in five familiar-sounding grades: SR, SR5, TRD Sport, TRD Off-Road and Limited. Each is available in 4×2 and 4×4 variants, which look identical because they share the same stance. The familiar Access Cab and Double Cab choices remain, with the former matched to a 6-foot bed and the latter offered with either a 5-foot short bed or a 6-foot bed on a long-wheelbase chassis. There is no regular cab model. The SR is the work truck. It comes standard with the base 2.7-liter four-cylinder engine and rides on 16-inch wheels and tires. The SR5 also rides on 16-inch wheels and tires, but it’s nicely equipped for mass appeal, and a V6 upgrade is possible in all configurations. The V6-only TRD Sport and TRD Off-Road share identical asking prices. But the Sport has 17-inch wheels, a hood scoop and pavement-biased suspension tuning, while the TRD Off-Road has 16-inch tires with Kevlar-reinforced sidewalls, an off-road-tuned suspension, a push-button locking rear differential and other goodies. And then there’s the Limited. It features 18-inch wheels, leather seats, standard everything and a single configuration: Double Cab, short bed, V6, automatic. We first hopped into a V6-powered TRD Off-Road 4×4 Double Cab with the new six-speed automatic because it just may become the most popular 2016 Tacoma combination. It’s a better driver in almost every way. Much less noise penetrates the cabin, especially from the engine. The cab feels tighter and more insulated, and the new engine doesn’t emit as much extraneous mechanical nonsense as the old 4.0-liter or even our long-term Chevy Colorado . And the prominent exhaust drone of the current truck has been dialed down to a distant murmur. The new 3.5-liter V6 feels stout and provides plenty of punch, but the 42-hp bump isn’t as noticeable as we expected. Perhaps that’s because the torque output hasn’t budged. Well, it has changed, but only by 1 lb-ft — and in the wrong direction. The generous sidewalls of the P265/70R16 tires pair nicely with the Bilstein monotube shocks to filter out pavement ripples that we didn’t know were there — until, that is, we drove a Limited back across the same roads with its 18-inch rubber and standard suspension. It’s a noticeably firmer setup, but not uncomfortably so. Body roll is gradual and restrained, and there’s an overall coordination that makes the trip to the trailhead enjoyable. Best perhaps is the steering, which offers up a steady sense of direction, with effort that builds up smoothly and returns the wheel to center accurately as we bend in and out of turns. We discover later that this is, in fact, genuine hydraulic power steering. The road abruptly turns from pavement to gravel, but it hardly matters. The Tacoma remains responsive and light on its feet and the Bilsteins soak up the lumpy washboard surface. Soon we encounter a short climb that requires low range. The range-select knob is barely in the detent when the “4Lo” status light winks on. It’s the quickest transfer case shift we can remember. Low range opens up two new 2016 Tacoma features that are exclusive to the TRD Off-Road version: Multi-terrain Select and Crawl Control. Each has five settings that are controlled by an overhead knob. We dial up “2” on the Crawl Control spectrum, pull our feet away from the pedals and steer over a nearby precipice that’s so steep there’s a rope to aid pedestrians. The ABS system grunts and clicks, but the descent is steady and effortless. Then we do it again, only uphill. The 2016 Tacoma’s most basic off-road assets are plainly visible. All versions have 9.4 inches of ground clearance, which bests its GM competition by more than an inch. The TRD Off-Road offers a 32-degree approach angle, but even the others are good for 29 degrees because their added fuel-saving chin spoiler is set back out of the way. A Colorado can’t manage 18 degrees, and its prominent spoiler isn’t designed for easy removal. What About Towing and Hauling? Toyota has the Tundra for heavier towing jobs, but a 2016 Tacoma V6 with the Tow package is no slouch. Its maximum SAE-certified towing capacity is up 300 pounds for a total of 6,800 pounds on the Access Cab 4×2. That figure drops to 6,700 pounds for the slightly heavier Double Cab, and you can subtract 300 pounds from each for their respective four-wheel-drive versions. Payload ratings are up across the board, with the maximum figure rising from 1,500 to 1,620 pounds. The 2016 Tacoma retains the composite bed from last year, which makes the expense of an accessory bedliner unnecessary. A weather-protected 400-watt 120-volt power outlet remains, and the once-optional deck rail tie-down system is now standard. A damped tailgate is new this year, and its release handle now contains a standard back-up camera that’s also useful for hitching trailers. Nighttime loading is aided by new LED lighting built into the third brake-light housing, and the contents of the bed can be hidden under a new lockable tri-fold hard tonneau cover that can be bought as a factory-installed option or added later as a dealer accessory. Slide behind the wheel and you’ll find a chunky leather-trimmed steering wheel that frames attractive gauges and a new information screen. The trip computer resides here, and this is where the Crawl Control and Multi-terrain Select settings are displayed as you make adjustments. A thankfully upgraded tire pressure monitoring system (TPMS) displays its pressure readings here as well. The handsomely trimmed dash expands out horizontally toward the passenger in a way that enhances the sensation of interior room and width. But it’s not just an illusion, because the reinforced doors and restyled door panels allow for a full 3.6-inch increase in front hiproom. Headroom is down a half-inch, and this is compounded by the intrusion of the newly available Double Cab sunroof and four-way seats that offer no height adjustment. This would be OK if the telescoping steering wheel pulled back far enough, but we could use another inch. We eventually settle in well enough, but the driving position has never been the Tacoma’s strong point. The tradition continues. Tacoma offers another pair of midsize truck firsts in the form of keyless start and dual-zone automatic climate control. The latter is controlled by a pleasing array of buttons and knobs that feel good to the touch and need no tutorial to master, a description that works for most other controls, too. Just ahead of the shifter (which itself has been reworked for vastly improved feel) lays another unique feature, an optional Qi-compatible wireless phone charging pad. Significant audio and connectivity advances come courtesy of Toyota’s newest Entune technology interface, and the SR grade’s first-tier system starts things off with a 6.1-inch touchscreen, AM/FM/CD, Bluetooth phone and audio, USB integration, an aux jack, voice recognition (with the option to access Siri on a connected iPhone) and a display screen for the back-up camera. The second-tier system on the SR5 adds Sirius/XM radio and supports smartphone-enabled navigation via the free Scout GPS Link app. The third-tier Entune premium audio system comes in at the TRD level, and it adds a 7.0-inch touchscreen, navigation, HD radio, an AM/FM pause and cache feature and access to the Entune App Suite. Fixed volume and tuning knobs are present, but the viewable screen is surrounded by an array of touch-sensitive shortcut buttons mounted flush under the same expanse of black glass. It looks great and…it’s fast. As in, zero lag. Competing systems we’ve learned to tolerate now seem as if their circuits are bathed in chilled molasses. We’re looking at you, Colorado. Dealer showrooms will start receiving their first shipments of the 2016 Toyota Tacoma as early as September 10 of this year. The cheapest entry-level SR Access Cab 4×2 with the 2.7-liter four-cylinder will start at $24,200. At the other end of the scale, the top-of-the-charts Limited 4×4 will set you back $38,720. That puts the TRD Off-Road and TRD Sport Double Cab short bed near the midpoint, where each goes for $31,665 with a V6, automatic and two-wheel drive. That price rises to $34,630 if you upgrade to four-wheel drive, but you can get your TRD V6 4×4 fix for $33,000 if you take the six-speed manual. If you’re a fan of the Tacoma, this is a great pickup truck to consider with its exterior and interior redesign and updated technologies. 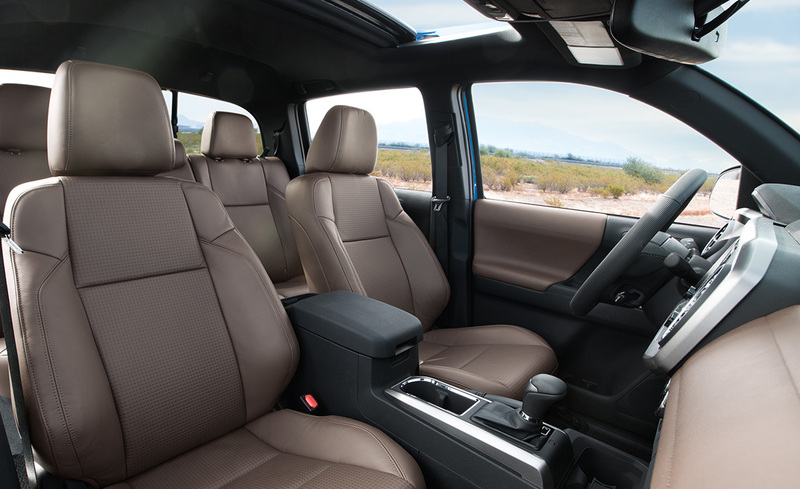 Although the 2016 Tacoma isn’t drastically different from its previous models, familiarity is a sense of comfort.